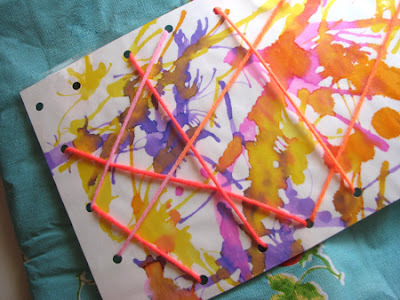 This activity is for you to set up for your kidlets. It takes a little more time than others but once you have set it up, the cards should last a good long while. 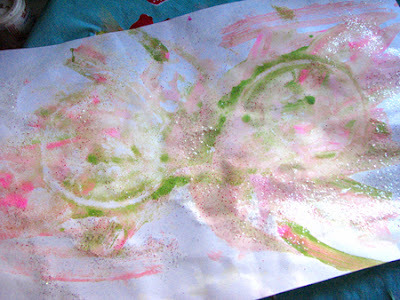 Sure, you can go buy a set for a wad o' cash or you can make your won featuring your kidlets' fabulous artwork. It's a no brainer in my eyes, though the other set is kind of spiffy. 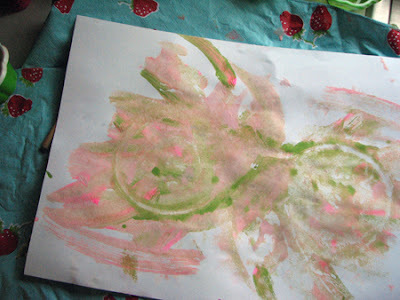 Get your wee one's art laminated at a copy shop or do it yourself if you have a laminator. Cut the laminated piece into multiple squares and rectangles. 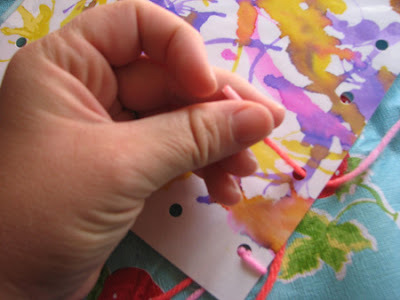 Curve the corners with a pair of scissors so the pieces aren't too sharp. 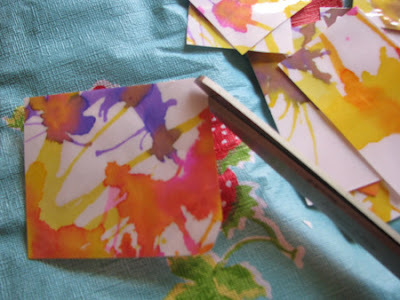 Now, cut a small half inch slit with the tip of your scissors into one side of the card. Next, cut another slit overlapping the first one so that you have a tiny piece of scrap paper to pull out leaving you with a groove of sorts. This part is necessary so that two pieces will fit together nicely without being all wonky and such. Repeat this process so that each side of each piece has at least two slits. (This part travels easily so you can plop it ll into a baggie or container and take it on the road to work on while waiting to pick your kidlets up from wherever it is you pick them up.) Once you are done, you are done! Yay! 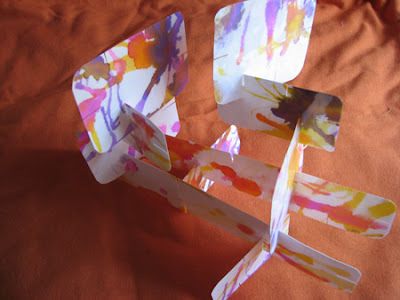 Keep all pieces in a container that is accessible to your wee one's and watch them create! You can do this with an old deck of playing cards also, no lamination needed. If you are adventurous you cab cut the artwork up into all sorts of shapes and sizes. 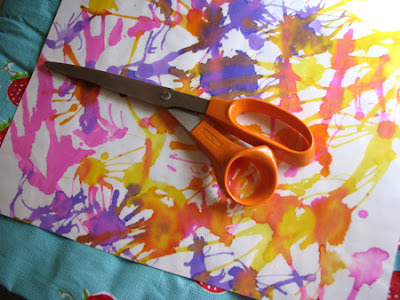 If your kidlet is old enough, let him or her cut their artwork up. Experiments and as always, have fun! Not that we are all swimming around with oodles of giftcards carelessly tossed about, but if you do happen to have a couple and you're on your way to Target (or Old Navy, or Kmart, etc.) to use 'em up, don't toss them when you're done with them. 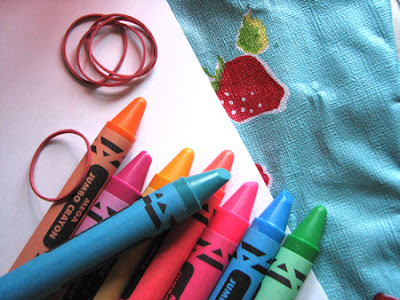 There are oodles and bunches of things you can do with them. Some giftcards have illustrations by the talented likes of S. Britt and Anna Chambers which are perfect for collecting. Or, you can teach your wee ones all about capitalism early, pretend they are credit cards. All sorts of fun can be had, all ya gotta do is think outside the box. Luckily for you, we do a little of that here or you and here's what we've discovered, giftcards are cool! Target carries some of the niftiest cards we've ever come across. From the fly-eye goggle cards to the build-your-own Target dog to the spinning pinwheels, these puppies are perfectly sized to keep in your bag or pocket for those moments when your kidlets need SOMETHING. They even work in the car! 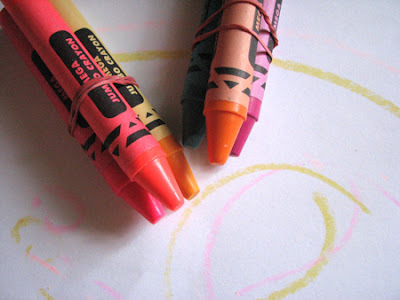 One of my most recent discoveries is perfect for a quickie art project. Check it out! Horde giftcards that have slightly raised images, these are perfect for crayon or chalk rubbings. Have your kidlet slide a giftcard under their paper. Next, have your wee one pick out a crayon and quickly rub the crayon back and forth over the paper where the giftcard is hiding. Ta-da! Instant pictures! Not all cards with raised images will work but it makes for a good lesson in observation and casue and effect. With cards so cool, I've been known to pick up a couple for myself just to have on hand for some printmaking. Have fun! That's where he paaarrrrrked the caaarrrrrr! Yup folks, today is international Talk Like a Pirate Day so I say go for it mateys! 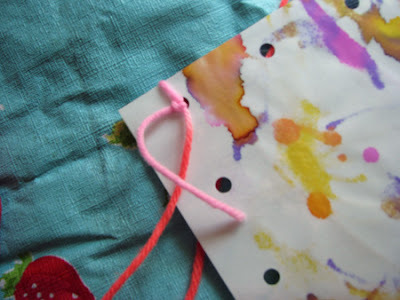 Check out my newest kaboodle list for some linky, crafty fun and then hop on over to my newest listmania list for some nifty pirate book recommendations. I wish I had some pictures for you to enjoy, check back later this week for some more artsy fun. Oh, and I'm pulling this link out form a previous post, get your own Pirate Name here! Mine is Cap'n Agnes Skullcrack! Hee-hee! 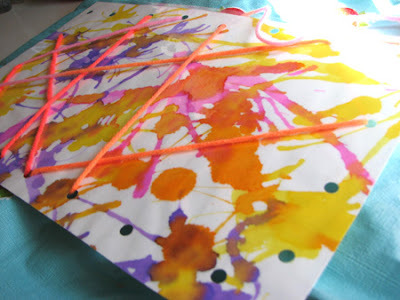 Turn your kidlet's artwork into a tactile fun project. 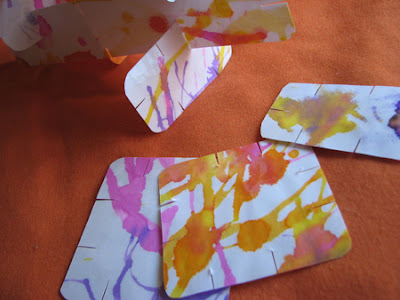 This is a project for YOU to make for your WEE ONES using THEIR art! 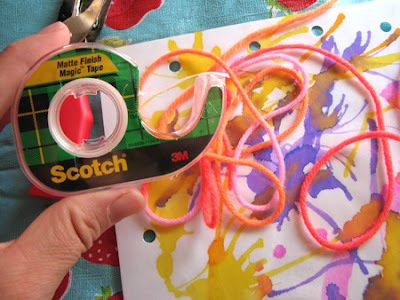 Do you remember lacing cards also know as sewing cards? 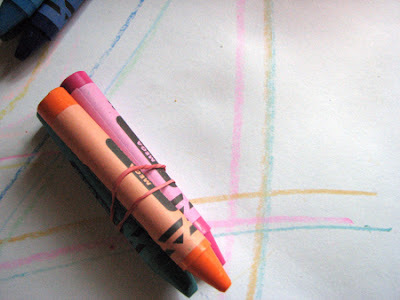 These make for great old fashioned fun and can last a long time. 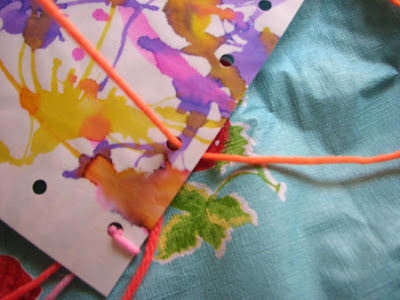 The cool thing about making your own lacing cards is that it will make your kidlet proud so have something so nifty that came from their little creative brain and the cards will help develop hand-eye coordination, small motor skills and cause & effect. These would also make for great handmade gifts! Have fun! 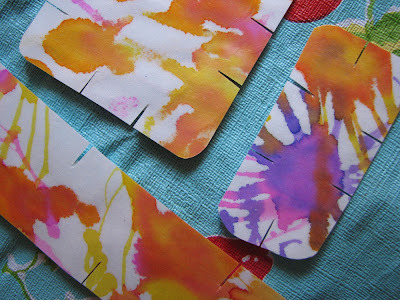 Laminate your kidlet's artwork or take it to an office supply store and have them do it. An eleven by seventeen laminate sheet typically costs about $2. You may have to trim the artwork to fit the sheet. 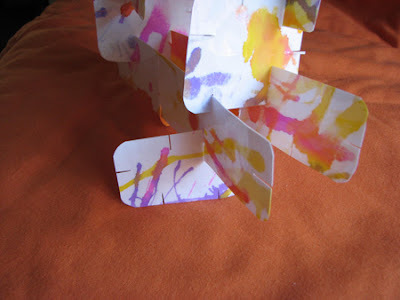 Using a hole punch, punch holes all along the four sides of the artwork. I spaced mine about and inch and a half apart. 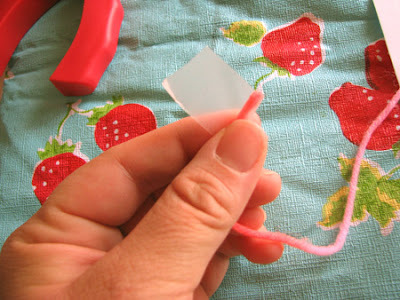 Thread a two foot length of yarn through a plastic sewing needle (these are big and not too pointy, perfect for kidlets 3 and up)or wrap a small length of tape around one end of your yarn making it a bit more stable for threading. 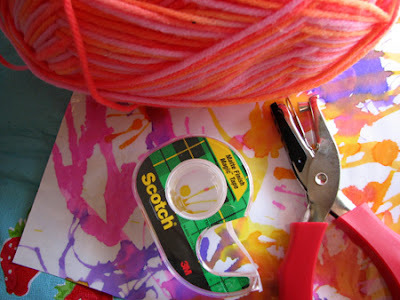 Tie the other end of the yarn through one of the holes and let your wee ones have a go at it. They can go in and out and over. They can criss-cross to their hearts content and you can always give them more yarn. If they want to do it again, just unlace the whole shebang and start over. Endless hours (or minutes) of colorful fun! You can also find nifty lacing card sets at eeboo! 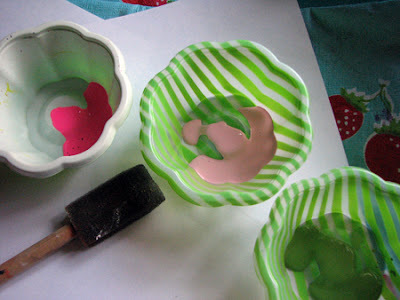 This is a fun and easy project to do to make painting seem new. All ya need is paint, preferably something thick like finger paint, tempera or acrylic, heavy paper to paint on and another piece to lift the image. 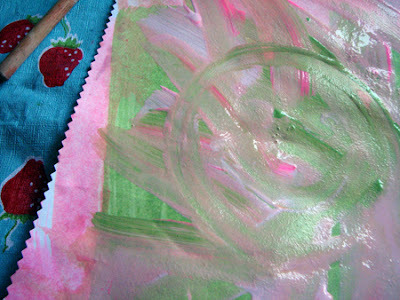 Set out your supplies andh ave your kidlets paint or finger paint on their paper. The thicker the better so go ahead and let them paint on top of their paint! 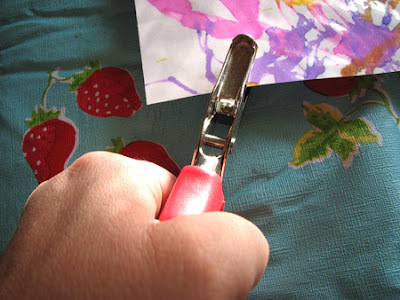 Once they are finished painting, have them doodle a few designs with their finger, if the paint is thick enough , sometimes this will cause a negative on their mono print paper. 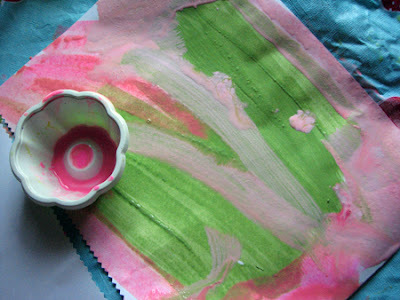 Next, place a blank sheet of paper over the painted piece and rub. 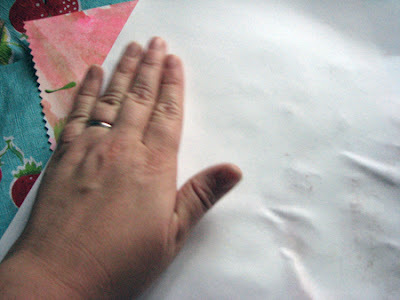 Gently pull paper off and you have a print of the artwork! 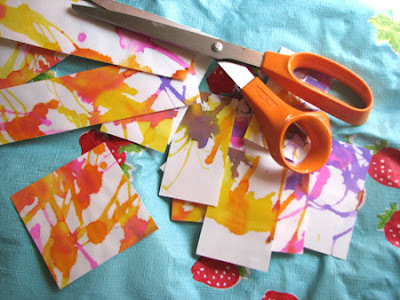 To jazz it up a bit, add a blob of glue to a small amount of water and have your wee one's paint the glue/water mixture over their picture. If the print is thick, you won't need to use glue so skip this part. 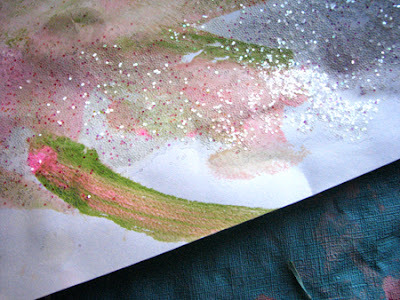 Add glitter and set aside to dry. 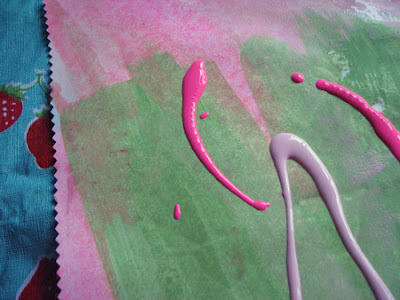 Lookie, a sparkling, dazzling mono print! Have a bored kidlet and nothing exciting to put together for fun? 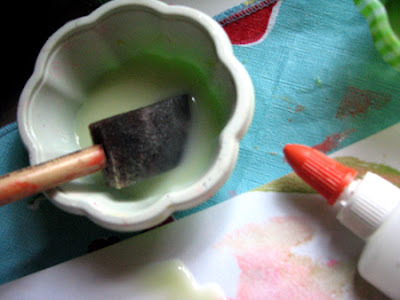 Pull out the neglected old crayons and entice them into some waxy fun! 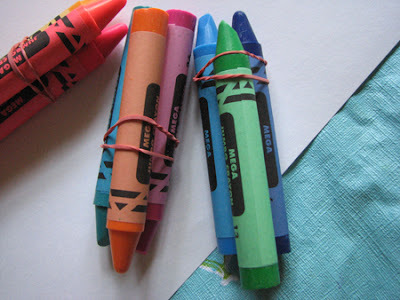 Set out your paper for your wee ones to draw on and bundle up the crayons in groups of 2 and/or 3 using masking tape or a rubber band. 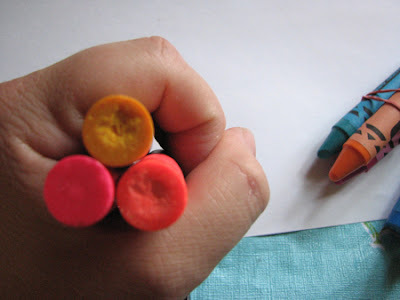 Using the classic ice-cream cone grip, have your kidlets scribble away not with one, but two or more crayons at a time! 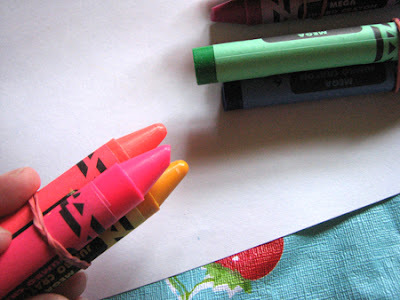 Enthusiastically tell them how exciting their scribbles are, point out the multiple lines and let them see how many crayons they can bundle up and draw with. The fun may not last for too long but it just may be enough time for you to get a meal ready or a phone call made! In the states, now is the perfect time to stock up on crayons what with back to school and all that happening.